The age-old challenge – finding that perfect spot to pitch the tent. Written somewhere, the law of camping must state that the flattest ground must also be riddled with tree roots or other obstacles. Fret no more. The CampgroundTour Gear Essentials team has put together the following round-up of the top sleeping pads to ease your pain. Sleeping pads are a great way to a better night’s sleep. In fact, having a quality sleeping pad is a must to achieve the temperature rating of your sleeping bag. Why? The EN 13537 measurement – which is growing in popularity – assumes the sleeper wears a single synthetic base layer (both top and bottom), a hat, and uses a closed-cell foam sleeping pad. Sleeping pads come in two main type: air pads and foam pads. Personally, I find that air pads are more comfortable, but they can be more expensive and are not as durable as foam pads. Puncture an air pad and you are in for an uncomfortable sleeping experience! 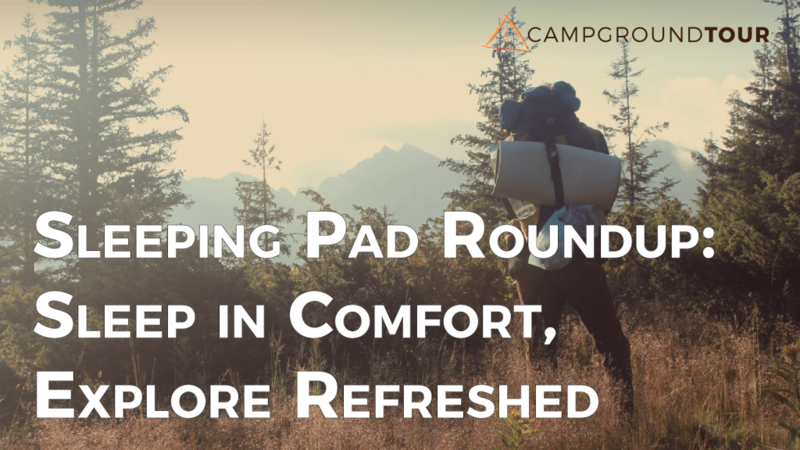 On the other hand, foam pads are more durable and versatile – use as padding around camp, for instance. Tip: consider packing a small repair kit to keep your air pad in top notch, even while trekking through the great outdoors. Some air pads come with included repair kits, but having a kit on hand can prove a lifesaver! R-value indicates a sleeping pad’s insulating factor – and in turn – the warmth it maintains. Higher R-values indicate a sleeping pad with a greater insulating effect, while lower R-values often translate to lighter sleeping pads, but less insulating ability. As a general rule, R-values range from 0 through 5+. Sleeping pads in the 0-1 range are generally suited for warm weather trips. Most 3-season (spring, summer, fall) trips are well-covered by a sleeping pad in the 1-3 R-value range. If you do any serious late-fall or mild-winter camping, look for sleeping pads with an R-value above 3. Keep in mind that stacking sleeping pads increases the insulating factor. For those serious mid-winter freezerees, find the highest R-value pad, or combine multiple! Keep in mind that the longer and/or wider the pad, the greater the weight. Unless you are planning a backpacking trip, the length/width of your pad should target your comfort – choose a pad long enough to support and insulate your head, torso, and heels. Thickness of the sleeping pad directly impacts comfort, and for air pads, allows greater flexibility in adjusting firmness. “Bottoming out” is one of the greatest considerations when evaluating sleeping pads by thickness. Choose a sleeping pad thick enough to support areas of the body such as hips, head and heels without bottoming out and allowing those areas to touch the ground below. If backpacking is on your adventure list, consider choosing a sleeping pad that packs down to a portable size. Bulky pads often require strapping to the frame pack, exposing them to punctures, scratches, and the elements. Obviously price can drive purchasing decisions. Weigh the considerations above against price, but remember that a sleeping pad is equally as important as a quality sleeping bag to ensure a comfortable night’s sleep in the great outdoors. Without a pad, you aren’t giving your bag a chance to perform to its fullest potential. Read on for our top 5 Gear Essentials sleeping pad reviews. Packing an R-Value of 3.4, the Therm-a-Rest ProLite Plus is a more traditional sleeping pad. Self-inflating, this pad won’t leave you light-headed while inflating. The Therm-a-Rest ProLite Plus weighs in at 1 pounds, 6 ounces and measures 20 inches in width by 72 inches in length (assuming the regular size – a larger size is available increasing the width to 25 inches and length to 77 inches). The Exped SynMat Hyperlite features microfiber insulation bound both to the top and bottom of the pad for increased loft and insulating effect. Air chambers on the Exped SynMat are taller at the edge than in the center, giving the mat a subtle cradle shape. This helps greatly to prevent rolling off the mat in the middle of the night. The Therm-a-Rest NeoAir All Season sleeping pad includes a stuff stack, mini-pump, and repair kit. The included mini-pump helps avoid wetting the insulation and decreasing the insulating performance of the pad. Even though the NeoAir All Season provides exceptional insulating ability, it packs small – down to nearly 10″ long and roughly 5″ in diameter. This portability provides an excellent balance between comfort and packability. Weight 1 lb. 9.5 oz. The Sea to Summit Comfort Plus Insulated sleeping pad features 548 Air Sprung Cells providing exceptional support and comfort. The high 5.0 R-value is sure to keep you warm in even the most demanding late-season conditions. The 40-D rip-stop nylon material helps avoid accidental damage, striking a nice balance between weight and durability. This pad includes a stuff sack and repair kit. Weight 1 lb. 1.2 oz. The Therm-a-Rest NeoAir XTherm sleeping pad provides unmatched weight-to-warmth. Designed as a 4-season sleeping pad, the R-Value of 5.7 will keep you warm in nearly any condition. Despite the high R-value, the NeoAir XTherm packs down to an impressive 8x8x6 inches, just slightly larger than a one-liter water bottle. Comfort and stability place the NeoAir securely at the top of the CampgroundTour Gear Essentials’ pick for top sleeping pads. Adding a sleeping pad to your outdoor equipment proves a wise choice, and makes all the difference between a cold, uncomfortable night and one that you will enjoy. Carefully consider your planned excursion and select a sleeping pad that compliments your outdoor goals. If backpacking is a consideration, look to strike a balance between light weight and durability. If hauling gear in a vehicle, or camping with children and pets, durability should rank high on your list of considerations. We hope this Gear Essentials sleeping pad roundup proves helpful. Do you have a favorite sleeping pad that we haven’t highlighted? Share in the comments below, and, until next time, keep exploring!